Test Tube Stand 6 Holes is autoclavable made of Polypropylene for better visibility . This 6 place rack is supported by 2 columns. The top plate has 2 holes for holding 25 mm dia test tubes, 4 holes to hold 16 mm dia tubes where as the base has corresponding hemispherical wells. It also has six vertical pins for drying tubes. 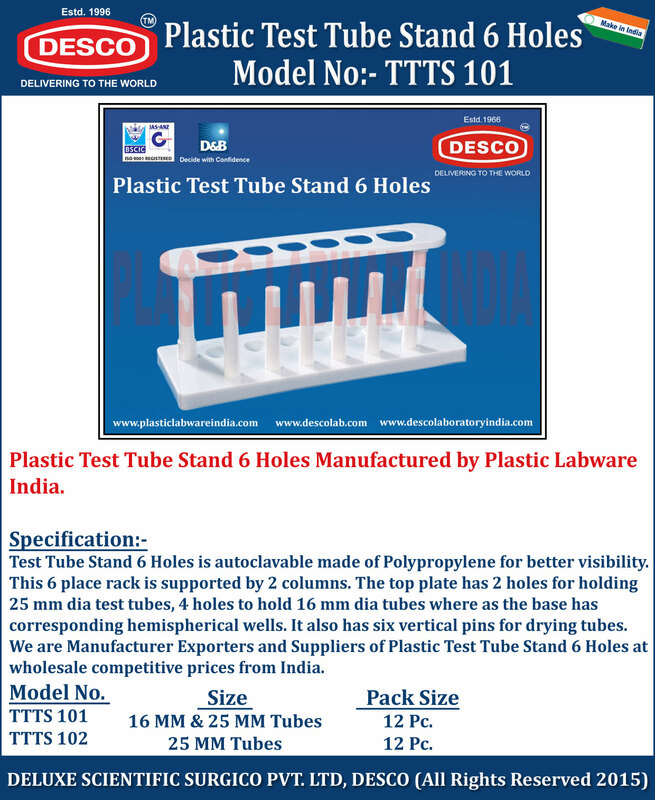 We are Manufacturer Exporters and Suppliers of Plastic Test Tube Stand 6 Holes at wholesale competitive prices from India. TTTS 101 16 MM & 25 MM Tubes 12 Pc. TTTS 102 25 MM Tubes 12 Pc.